Painting fur can be easy if you go the drybrush route. And it doesn't look half bad either. But if you really want that "finished" look, try line highlighting each strand. I know, I know, shouldn't it be about making things easier and not harder when it comes to painting. Yes and no. In this case, I figured I'd share with you how I highlight fur if I'm going for that super clean and finished look and trying to avoid that "drybrushed" look. With the model above, I went this route because the individual fur "pieces" are slightly larger than usual and sometimes just drybrushing can bring out unwanted texture and make the piece look unfinished or sloppy. Don't get me wrong, drybrushing has its place, sometimes though, you need to bite the bullet and go the extra step to get the really nice results and skip drybrushing. Now this model is a one off so I don't have something like three or four squads to do and I can afford to lavish some attention on his details. I start with painting the whole fur area black. 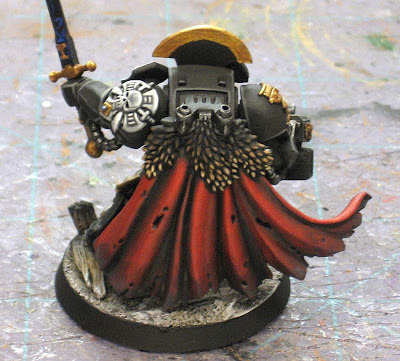 It helps that black was the color I primed my model with as well. You can see the cape portion is already done, so it was just a matter of cleaning up some edges really. Now you'll need to know the color scheme of your fur in advance. In this case, I'm going from light tan at the bottom up to black at the top. The first layer is a dark brown and I start with it at the bottom. I carry that color up about 3/4 of the way to the top. As I get closer to the top, I don't apply the paint as heavy (or thin it as needed) so my actual color is closer to black. You don't need a perfect blend here, just get it close enough. The next step is a lighter tan. Again, starting at the bottom and working my way up to the top. This time only going about half way. This should leave some of the first dark brown layer as a transition color between this layer and the black at the top. Next is a pass along the bottom 1/4 with a real light tan color. This will be the lightest the fur gets on this model. And last but not least is a very quick pass across the very top in the black area with a dark grey color. This is to give a little highlight to the black and add some variety to the area. You want to make sure you don't go down into the brown so it's just a matter of hitting the very few top pieces of fur. 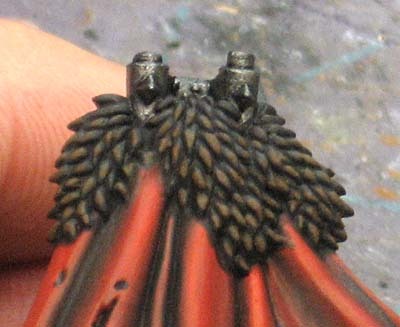 Wow - there really is a difference between that method and the drybrush method. This looks really nice and polished. It really comes down to what kind of fur you have on the model. This sort of longer stranded 'hair' fur is actually much easier to get looking 'right' when you do it this way. I think trying to drybrush this just ends up looking far too sloppy to be completely satisfied. 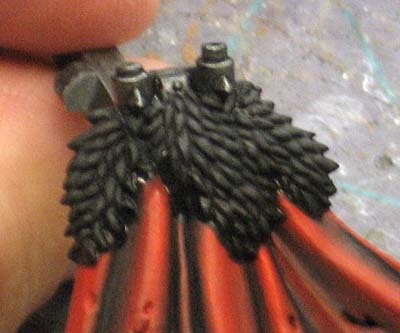 But trying to use this same method on some of the matted fur style that some models have modeled on them (I'm looking at you old school Space Wolves!) 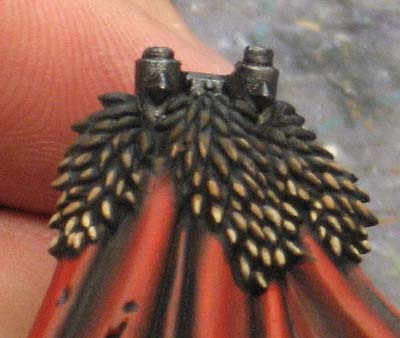 you would quickly drive yourself insane trying to get the individual strands painted! IC: There is a difference for sure, but like Grey Death mentioned after your comment. It needs to be applied to the right surfaces. Grey_Death: You're absolutely right. Some fur can be drybrushed and look just as good. It just takes looking at your model before choosing a specific approach. Very nice tutorial Ron. 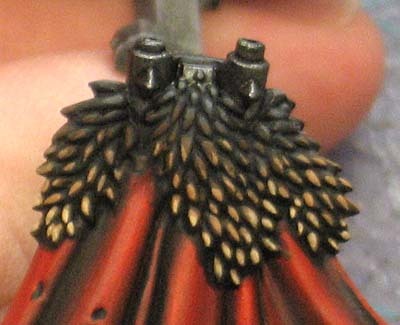 I finaly understood how you can make the fur fade to a dark colour. I'll have to try it on my Horus Conversion... which has been left in an undercoated stage for the last 3 years! Very nice turorial, especially since you didn't apply it to ALL the fur and gave it that fade top to bottom overall. Gotta save this to remind me not to cut corners on fur. The cape is amazing too btw. Brother Captain: Good luck with your model. You can vary the distance and amount of each color you leave showing in order to change then "blend." Baraccas: Thanks. 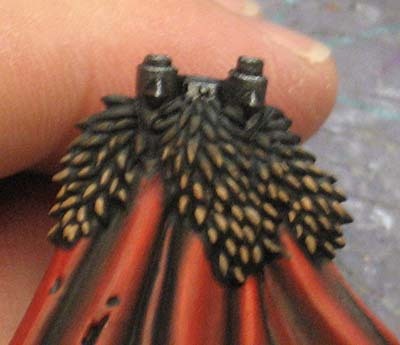 The cape is just wet blending. It's got it's specific applications, but in those cases, it's hard to beat. I tried painting fur once, but the cat wouldn't hold still. Pastafarion: Good point about getting them all out and ready. I do that when I wash models and want to use different colors at the same time. EastwoodDC: A funny visual, but I would never advocate animal cruelty.